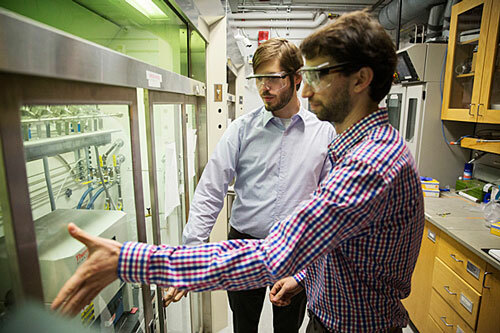 (Nanowerk News) Harvard scientists have developed a first-of-its-kind method of creating a class of nanowires that one day could have applications in areas ranging from consumer electronics to solar panels. The technique, developed by Bobby Day and Max Mankin, graduate students working in the lab of Charles Lieber, the Mark Hyman Jr. Professor of Chemistry, takes advantage of two long-understood principles. One is Plateau-Rayleigh instability, an aspect of fluid dynamics that describes why a thin stream of water breaks up into smaller droplets. The other involves crystal growth. The technique is described in a paper recently published in the journal Nature Nanotechnology ("Plateau–Rayleigh crystal growth of periodic shells on one-dimensional substrates"). A new, first-of-its-kind technique developed by Bobby Day (left) and Max Mankin, graduate students working in the lab of Charles Lieber, the Mark Hyman Jr. Professor of Chemistry, could have applications in areas ranging from consumer electronics to solar panels. First described in 1870, Plateau-Rayleigh instability is normally associated with liquids, but researchers for years have recognized a similar phenomenon in nanowires. When heated to extreme temperatures, the wires transform from solid into a series of periodically spaced droplets. To create the new type of wire, Day and Mankin heated traditionally grown nanowires to just below that transformation point in a vacuum chamber, then pumped in silicon atoms, which spontaneously crystallize on the wire. Rather than form a uniform shell, the atoms grow into regularly spaced structures, similar to the droplets that appear when nanowires break down at high temperatures. Unlike with the droplets, though, the process can be tightly controlled. Along with duplicating the process in nanowires between 20 and 100 nanometers in diameter, researchers demonstrated the process using several combinations of materials, including silicon and germanium. In addition to being able to “tune” the distance between the lobes on nanowires, Mankin said tests showed they were also able to tune the cross-section of the wires. With those new structures, researchers found, came new properties for the wires. While Day and Mankin’s study focused on the wires’ ability to absorb different wavelengths of light, both said additional research is needed to explore other properties. Though it may take years to fully explore those additional properties, Day and Mankin said applications for the new wires could emerge in the near term. The new wires’ unusual light-absorption abilities don’t end there, though. By shrinking the space between the crystalline structures, Day and Mankin discovered that the wires not only absorb light at specific wavelengths, they also absorb light from other parts of the spectrum.